For the second time, a call went out on the Dutch Wikipedia; there will be a Wiki meet up in Brussels. WalterBE had been contacted that SJ would be in town and this was enough of a reason for a meeting. It is the second time that there was such a meet up; the first time in the day when Wikipedia was young, there was much more advance warning and, in the end there were two people. Walter and myself. We had a good time; went to what was the colonial museum and ended up in Gent where we saw this beautiful city by boat. 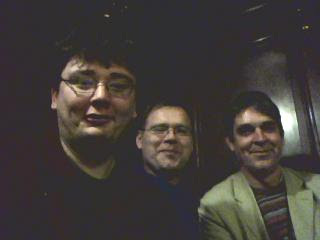 The 2008 meeting featured a 50% increase of attendees counting the Dutch language Wikipedians. This time it was OLPC time. Samuel was in Europe for a meet-up of key OLPC Europeans, they were there to smoothen the roll out of their “get one, give one” project. Meeting these people is quite similar to meeting Wiki people, there is a similar spirit of enthusiasm and passion. They are knowledgeable and there is a perceivable spirit of “we are going to make this work”. I had reasons to be amazed. When people ask me about the projects that I am involved in, I always mention SignWriting. It is not that I consider myself the most knowledgeable or the best placed person to promote this wonderful cause, I do promote it and this has become a cause that is dear to me. I was amazed that one of the people there actually knew about it; he had learned about it at Gallaudet university and he even expressed an interest in testing the latest software on the XO. Many of the issues that I have noticed with MediaWiki are as relevant for the OLPC. Usability, localisation and managing a complex infra structure are key. What I am grateful off is that with the OmegaWiki mark II approach it may have a chance to get a similar relevance for other platforms like the OLPC. When you are localising the MediaWiki messages on Betawiki, it often helps when you know how the same message looks like in other languages. It can inform in what languages a messages is still !!FUZZY!!. Brion Vibber announced that the upload limit on file sizes has been bumped up from 20 to 100 megabytes. This is particularly welcome news for the people restoring images. The practice is to upload both the original image and the restored image. Several of the original images were just too big. This good news comes as a consequence of the many new servers that have been installed. The question is if this will mean more reliable backups as well. When people translate, it is often not clear what the messages is there for. Individual messages may be part of a bigger message and, this can impact grammar. Messages may have multiple parameters and what they are is not necessarily clear from the message itself. 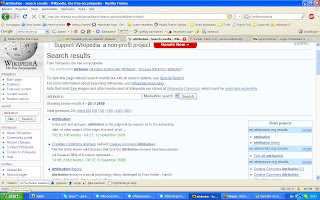 Betawiki became a superior environment for its localisers when it started to provide context for the messages. 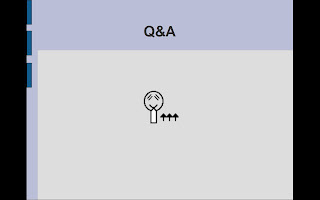 These messages are available as "qqq" messages. The person best placed to provide this help is the developer of the software. Second best are the people who have learned where a message appears. Given that Betawiki supports 298 languages. The pay back for this investment in time is obvious. Wikipedia is about encyclopaedic content. Articles about the same concept are connected by "InterWiki" links. 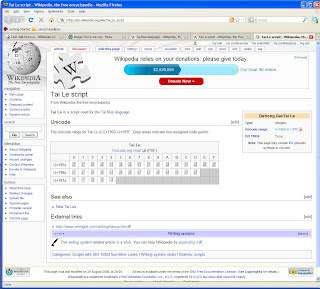 Links may exist to the Wiktionary in the same language for lexical information and when there are many files in Commons, there may be a link to Commons as well. These connections are the glue that bind the projects, and the languages together. They add real value to the projects. This value is already recognised in the way the search engine now provides links to sister projects in the same language. The links between projects are extremely valuable. Some are inferred as in the search engine and some are made explicit as in the InterWiki links. When you read an article in a language where the article is only a stub, you can find more information through the interwiki links. Everything should be linked in order to provide the best information and to make life easier for our readers, we should not forget the projects with little or no content. For them there is no place to make these connections. For these languages the least amount of information is not available anyway therefore the challenge is to provide a place where they can start connecting information for their people. OmegaWiki starts with a concept. This concept is defined in a language and on average nine tranlsations are known for it. When a language is added, slowly but surely a web of connected starts to build. Links to Commons, links to Wikipedia articles in other languages and links to other concepts in OmegaWiki. When the Wikimedia Foundation has sufficient resources, it may consider to support the not supported languages in this way. OmegaWiki proves that its concept works. The Tai Le script is a script used for the Tai Nüa language. The Wikipedia article is a bare boned article and it could do with some expansion. 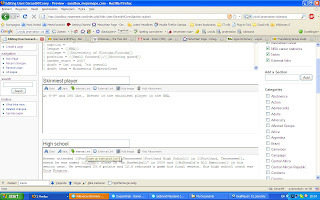 To show what this script looks like, the characters are shown when the user has the appropriate fonts loaded on his machine. Many people do not have sufficient fonts on their machine. There are solutions to this problem; the first is have people load fonts for all languages. 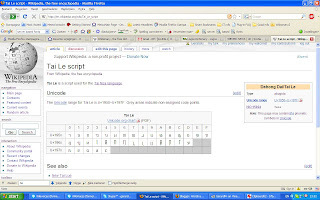 This is quite complicated; the font that I use for the Khmer script for instance does not show in Google Chrome. One strategy that would help for Wikipedia would be for the Wikimedia Foundation to actively support fonts for the scripts it uses in its projects.. that is all of them.. and provide them as a downloadable resource. Another possibility is to provide server side fonts. 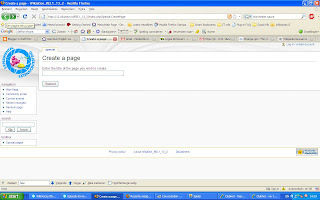 In this way fonts are loaded from WMF servers when the user does not have the appropriate fonts on his system. I have done some reading on the subject, it is doable but the providers of fonts are absolutely against this because people do not need to buy the fonts any more. Given that the WMF is about Open Source and given that many fonts are available under a free license, this is not an issue for the WMF. Barack Obama is the president elect of the USA. It is impossible to have missed this. His name is on everybody's lips, the people of Kenia celebrated his election with a day off from work..
How do you say and write Barack Obama? பராக் ஒபாமா, บารัค โอบามา, बराक ओबामा, ဘာရတ်အိုဗားမာ and باراک اوباما are just a few examples how different this can be. On the SignWriting mailing list there is a discussion on how to sign Obama. To appreciate this, you have to know that normally the name of a person gets sign spelled, they do not have a sign. People who sign have a sign for themselves. People who are important to the Deaf community may get one as well. Presidents of the USA are in their time known by a sign. These signs however need to be remembered and this is a generational thing. A sign for a person gets lost when that person is no longer talked about. Only George Washington and Abraham Lincoln have signs that are well known. Barack Obama does not have a universally known sign, this is because he has not impacted the Deaf community, so that is why he hasn't received a name sign. Previous presidents like Ronald Reagan did have a well known sign but as sign language is not preserved by writing, these signs slowly but sureley get lost from the shared memory. It is writing that preserves the ideas the concepts of a culture. It is only SignWriting that has the potential to preserve the concepts and ideas of today for the people who will sign tomorrow. In a Wikipedia for sign languages the signs of today will be preserved. The content of such a Wikipedia will include articles about what impacts the people of the Deaf community. It is funny because it makes me realise that the article of Valerie Sutton on the English language Wikipedia does not include her sign. I waited for a two hour download to finish. I watched it and, it had me think again about what makes a small wiki work. The UNICEF developers have been working hard making MediaWiki usable for their communities in Africa. They had people test their improvements and, they made a difference. With the improvements more people contributed to their Wikis. In their project 100% of the test group did not know how to create new articles. They just did not know how to. Having a button that helps to create new articles makes a big difference. Add to this standard templates for new articles and you have something powerful. Other innovations are in helping understand the editing. 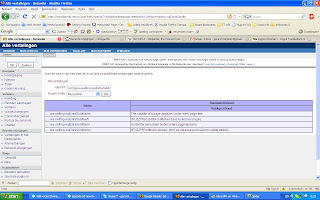 The text is split in sections and the categories are shown to the right of the screen. This also stimulated participation a lot. When people call Wikipedia a success, they are talking about a tiny fraction of our projects. The vast majority of the Wikipedias is small and is in need of both more content and editors. Usability is with internationalisation and localisation what helps readers connect to what we do and become editors. With the UNICEF people having spend a lot of effort on improving usability, we only need to adopt what has been learned. I am sure that certain people will find that some things might be done differently, more sophisticated but for me this makes the perfect the enemy of the good. Adopting the lessons learned, the new functionality will stimulate our smaller and smallest projects. That would be good. 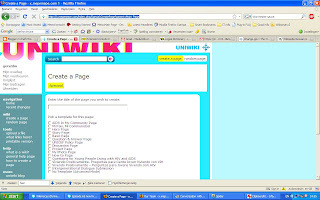 Support the Wikimedia Foundation so that they can improve the usability and allow us to do even better..
At the Wikimedia Conferentie Nederland Jan-Bart de Vreede mentioned Uniwiki and the Uniwiki functionality for MediaWiki. He mentioned that Kennisnet is interested in running this functionality on some of their wikis. At that time these extensions were not supported in Betawiki. Siebrand has spent more then a day preparing the i18n for these extensions. He found in this process that the software does not run on our "bleeding edge". He documented this in the code, we are trying to get into touch with the Unicef developers... Things are going reasonably well. Obviously I am glad that I can, it is just that we assume "instant on" functionality. As it is this time of year again, we are asked to support Wikipedia. Wikipedia is to be understood to be everything the Wikimedia Foundation stands for. When you ask people for continued support, one way of motivating this is by showing what has happened in the past. The WMF has published its annual report; it gives an accounting of what the WMF has been doing.. Practically, we have had a great year, the systems have proven reliable, the organisation has been relocated and fleshed out. Functionally many improvements were implemented, Single User Logon finally arrived. I learned at the Wikimedia Conferentie Nederland that an exportmechanism is about ready to export MediaWiki information into software used in schools. Because of all the great work that is done, I do endorse the Wikimedia Foundation. Obviously there are things where I think the WMF should do better. When you give them your support, it gives them the ability to be responsive to the future needs of its users and communities. Like many applications, MediaWiki has both core and extended functionality. There are a growing number of extensions and most are localised at Betawiki. For the developers who develop MediaWiki, Betawiki has proven itself a precious resource. 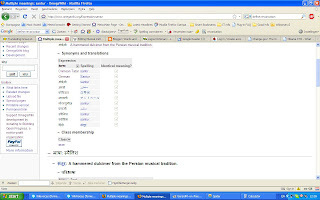 Many of the MediaWiki extensions have been adapted in order to get proper internationalisation. Recently, an extension developed by the UNICEF was worked on for more then a day and necessary feedback was provided about the code.. It just did not work for people wanting to implement it. As time goes on, extensions are localised in more languages. 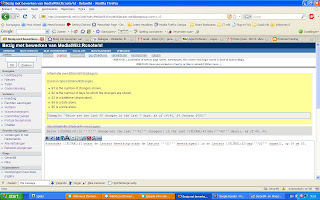 Siebrand has a list that every so often is updated with the extensions with localised messages in at least 50 languages. It is a list that is growing. As can be expected it is the extensions used by the Wikimedia Foundation that are doing particularly well, the support for FlaggedRevs is something that amazes me because it is only used on two projects as far as I know. I am happy to see the Babel extension localised in 122 languages. This makes it a really useful tool, it is sad that the WMF does not use it because many of its projects would benefit from the big support it provides. The Meta discussion is pretty much in favour and it can benefit all our projects. With Siebrand in a statistics mode, he also provided me with some more numbers.. Currently Betawiki supports 128 extensions with localisations in over 50 languages, in mid May there were only 64. In January, the extensions used by the WMF had 570 messages, currently there are over 1300... In January MediaWiki contained 1732 messages, now there are 2122, a growth of 23%... In January we supported 2077 extension messages, by now there are 5111, a growth of 246%. It is all the more amazing that the MediaWiki localisation community does this well. This screenshot is from the same machine, you will notice that Khmer shows up properly and the URL is much cleaner. Google has some more work to do to get Chrome right for me. Slideshare is a great resource when you have some presentations or slide shows to share. Do you have a .pdf a .ppt or an .odp, upload it share it and all the people that were not at the conference can have some impression of what was presented. 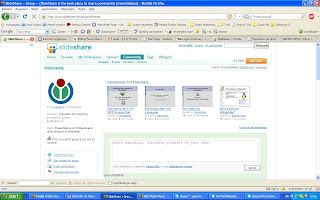 Slideshare relies very much on community effort; I was told by pfctdayelise about Slideshare. I had a look and I like it for what it does. I have shared some presentations in the Wikimedia community. There is one problem left. How do we share all our presentations? Where are all the other interesting presentations of relevance to the whole of the WMF community? Currently there is talk about including social networking functionality to the WMF on the foundation-l. I would welcome it because currently many of us use such functionality and our community is fractured over the many different networks. Yesterday, in my "On the monthly BetaWiki information" I suggested to have those wikis with inadequate localisation use the stable version of the MediaWiki software. This idea was because of my observation that a lot of "FYZZYING" is going on and, I associated this with the developement process. I have had a talk with Siebrand about this and he informed me that indeed it is part of the development process. It is however also part of a process whereby existing messages are proofread and internationalised. This changes the situation radically because this is exactly what benefits every localisation effort. It is for this reason that certainly at this stage all WMF wikis should stay on bleeding edge. The Betawiki statistics for October are in again. With the request for Western Panjabi we now support 321 linguistic entities. Of these only 102 provide the most basic support, 61 languages cover 90% of the core messages and 24 provide a 90% coverage for the extensions used in Wikimedia Foundation projects. The good news is that compared with last month, the numbers are essentially up except for the WMF used extensions. When you compare this with a year ago, you will find that we have come a long way. I was told at the Wikimedia Conferentie Nederland, that with the move to Betawiki by the German localisation effort more people had become involved and that the quality had gone up. At the same conference i learned that many people are just not aware of its existence and significance; I hope that we may expect some Frisians at Betawiki. Because of the continuous development of MediaWiki it is really hard almost impossible to maintain the localisation for a language. We have an increasing number of developers resulting in daily updates to the MediaWiki messaging and for the majority of our languages, it is impossible to keep up. After such a realisation, the question is how to support these languages better. It is arguably best for them NOT to run on the bleeding edge of MediaWiki software. Running on bleeding edge should be reserved to those languages who are able to maintain their localisation. With this discrimination in the support of languages, we give added weight to our stable software. This will improve the usability of MediaWiki for our end users. When we make such a division, the only argument should be the quality of the localisation effort. This would provide a powerful incentive for language communities to maintain their localisation in order to have the latest and greatest of what MediaWiki has to offer. It is crucial to keep in mind what this is to achieve; to provide our readers, our editors with the best support in our projects and localisation is essential. In Utrecht at the Wikimedia Conferentie Nederland, we had another really well organised and nice conference. Many speakers with relevant and interesting topics in three tracks, there were some really nerdy topics like 3-d printing and repairing doa OLPC systems, topics that were really well received given by people who lived their subject. I was invited to talk about "A Commons that supports languages" and together with Andre Engels, I was the first to speak in room C. Sadly a video projector was missing, so you see this presentation first.. Obviously there was a video projector for the next speaker. My presentation went well anyway. 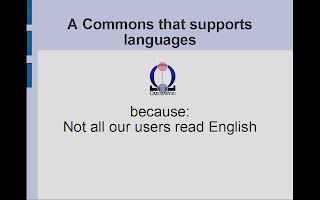 People in the Netherlands do appreciate why Commons should support other languages, they were happy to learn that we have demonstrated that this is something that we can do and they share my hope to see Wikimedia Commons content available for the other people of this world. People that have been at my presentation may know my last slide, so I have included it for those who do not know what it refers to ..